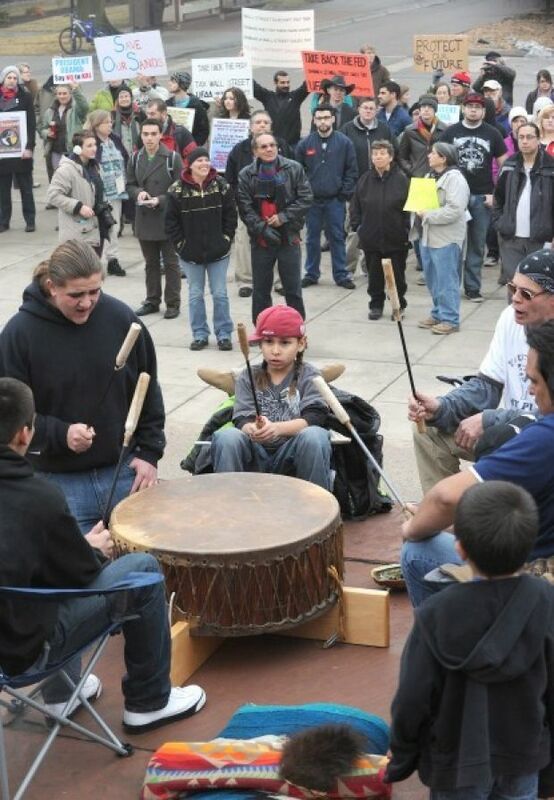 Native drummers perform at the start of a demonstration Monday by Keystone XL pipeline opponents. The pipeline would transport tar sands oil from Canada to the Gulf of Mexico. LINCOLN — Cowboys hats and shawls adorned a coalition of more than 100 ranchers and Native activists who gathered Monday at the state Capitol to protest the Keystone XL pipeline and show support for indigenous rights. As six children held up a large banner that read “Idle No More” and singers pounded drums, about half a dozen people spoke against the Keystone XL and perceived attacks on Native sovereignty. He criticized Gov. Dave Heineman for approving the pipeline’s route through Nebraska after initially opposing it. The economic benefits to be gained from the pipeline through jobs and development will be only temporary while the environmental effects will last for generations, Long Soldier said. Idle No More began as a response to proposed legislation in Canada that would reduce drastically the number of legally protected waterways and lower the threshold of consent needed to allow Native communities to surrender their lands. It has grown to include rallies and flash mobs by Native people across the country and in Canada. John Papan, an Omaha-Pawnee, said he attended a gathering last week in South Dakota where several tribes signed a treaty calling for protection of Native sacred sites along the path of the Keystone XL. He said the tribes were concerned about burial places and other sacred sites along the North Dakota-Canadian border, as well as other sites tribes have yet to identify and share in South Dakota and Nebraska. Ben Gotschall, whose family ranches in the Sandhills, said part of Keystone XL’s new route runs through the Sandhills — despite efforts to get the company to move it away from that part of Nebraska. He asked those in the audience to take two steps forward. “We’re two steps closer to that pipeline being stopped,” he said.